Everybody wants to know what everyone else thinks about Crazy Rich Asians (CRA), particularly, if you’re Asian. Many commentators have already weighed in about how CRA is either a triumph of representation for the Asian community, or an opulent neo-colonial misrepresentation of the Singaporean, Asian, and Asian-American ethnic groups, and an actively discriminatory film. These are critical issues that deserve attention, but they ultimately grapple with the contexts that the film interacts with, and not the heart of the film itself. If we want to understand what the film means to the people who are watching it, then we should first understand what the film is trying to say. Therefore, I hope to turn our attention to something beyond the current debate. I choose to see the excess in CRA as a mere accessory to its main message. In fact, I think that while the film’s Anglo-Chinese framing is saucy, exciting, and problematic all at the same time, it remains a frame. In my opinion, CRA succeeds thematically as a film because it touches on an idea that resonates universally. What is this idea? It is the power to overcome real, non-trivial divisions with love. Goh Peik Lin (pictured) and Rachel Chu having a conversation at a cafe located along Bukit Pasoh Road. Crazy Rich Asians is a film flushed with division. The most obvious axis of division presented is the difference in class and wealth between Rachel’s family and the Young family. Played by Awkwafina, Goh Peik Lin’s status as nouveau-but-still-obscenely rich is leveraged to give us a true sense of the gap between Rachel and Nick – if Peik Lin is already considered wealthy, what more the Youngs? However, the film doesn’t stop here – it subsequently layers on the cultural differences between the Asian and Asian-American. Rachel’s discomfort in amongst the Young family is highlighted by her ignorance of the family hierarchy, her attempts to converse in Mandarin, and the botched dumpling making date. As pressing and dramatic as these divisions are, the dumpling scene hints at a more fundamental division – a division in values between the East and the West. Specifically, the clash of individualism and communalism. Eleanor’s rejection of Rachel is actually irrelevant to their socioeconomic factors, or their cultural differences. In fact, Eleanor’s own story allows us to see how these two characters are more similar than different along those axes. Eleanor was rejected by her own mother-in-law as a result of coming from a lower and less wealthy social class. Eleanor also met her husband while they were studying in Cambridge – a foreign, Anglo culture. It is interesting that Eleanor frames the conflict as one between traditional Chinese ethnic values and modern corrupted Asian-American values, whereas this analysis reveals that neither Eleanor nor Rachel has retained a perfect form of Chinese-ness, as Eleanor herself is deeply Anglicized. What Eleanor was really criticizing was Rachel’s perceived individualism – an individualism that will render her unable to sacrifice her own hopes and dreams for the sake of the family, like Eleanor did when she dropped out of school. Eleanor is a sophisticated character because the film makes her too much like the protagonist to be a simple villain. By having two matriarch figures, Eleanor and her mother-in-law, the film allows us to discern between two rather distinct value systems. Eleanor’s mother-in-law, as elegant and matronly as she appears, cares simply and straightforwardly about the reputation and wealth of the family, and will not accept Rachel with her scandals. Eleanor, in contrast, displays a nuanced reconstruction of traditional values, where the community is not worshipped absolutely, but where the community is built and sustained through selflessness as a value itself. It is significant that Nick eventually proposes with Eleanor’s ring, not the family’s ring. Therefore the perceived division between how one values individual and the community is the driving source of tension and plot in Crazy Rich Asians. Divisions are the film’s problem statement. Then, what are the solutions it offers? The way these tensions are ultimately resolved is fundamental to the overall focus of the film. In order to understand these tensions and their resolution, we cannot ignore the film’s direct and persistent use of game theory. Game theory is a field of study in economics that studies decision-making and strategy under different circumstances, or “rules”. Game theory is overtly used to frame scenes and character dynamics in the film Crazy Rich Asians, and therefore game theory’s overall contribution to the plot needs to be digested. Rachel’s character is introduced as an economics professor specializing in game theory, and her opening scene is a classic example of one such game: Poker. We pick up a few quick facts about Rachel from the game of Poker: her intelligence and rationality. Rachel picks up the win by going “all in”, and calling her opponents bluff. Later in a conversation with Peik Lin, Rachel describes her interaction with Eleanor as a game of “chicken”. The game of Chicken involves any situation where two players are going to collide with each other, and the first person to swerve or get out of the way is the “chicken”, and loses out. These two games characterize Rachel’s initial “strategies” to fit into the Young family. She “bluffs” her way through the Young family party, wearing Peik Lin’s clothes and makeup, and for the most part, lying about her family’s history. When this strategy ultimately fails, Rachel believes Eleanor is testing her resolve by engaging in a game of “chicken”, and in effect doubles down on her “bet” by continuing to pursue Nick. What is ultimately significant about these two games, Poker and Chicken, is that they are both non-cooperative, winner-take-all games. In other words, there is always a winner and a loser, and the only way to win is by making the other person lose. The film could have ended right there, with some superficial reconciliation with Nick’s family, but we would have come away with a very different message. It would have been a triumph for individualism, of romance – for sure, but not of love. These simulated games are a frame for the audience to understand character dynamics, and also integral to the plot. They give the audience an emotional sense and an intellectual reason to believe that Eleanor and Rachel are characters that are fundamentally opposed, locked in eternal conflict. As tropes, they fit right into the fairy-tale archetypes of rags-to-riches Cinderella and the evil step-mother. This game-theoretic framing reinforces, if not undergirds, the divisions that drive the plot forward. We have been conditioned to root for the protagonist, and that’s why Nick’s first proposal to Rachel worked marvellously as a false ending. The film could have ended right there, with some superficial reconciliation with Nick’s family, but we would have come away with a very different message. It would have been a triumph for individualism, of romance – for sure, but not of love. 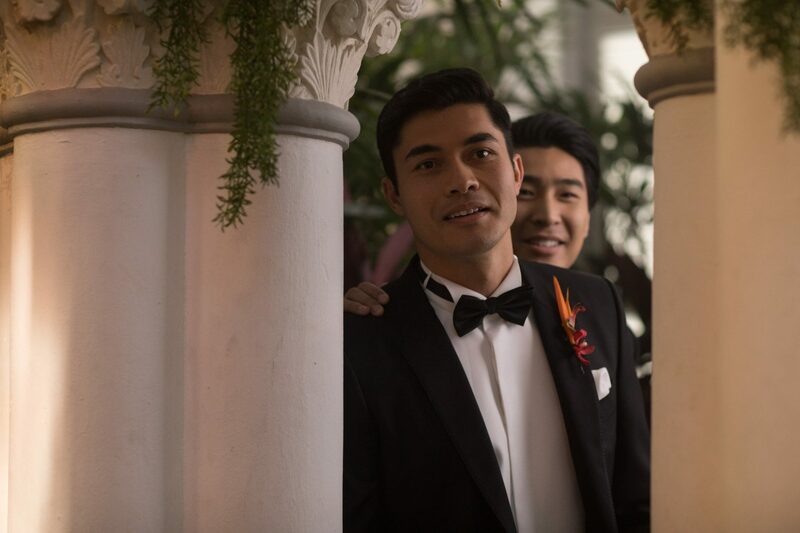 If Crazy Rich Asians is really about grappling with what being a Chinese person is like in this modern age, then the success of Nick’s first proposal would have come across as not only deeply dissatisfying but also entirely missing the point of tension. At this point in the film, we pivot to the third “game” in Crazy Rich Asians: the game of Mahjong. In many ways, Mahjong operates symbolically as the Asian counterpart to Poker. For the uninitiated, Jeff Yang’s article does justice to Mahjong and its symbolism in CRA in this article. However, Mahjong differs to Poker in one crucial respect: that is, one can pick up another player’s discarded tiles. This introduces an element of interdependency to Mahjong absent in Poker. In other words, even if the rules of Mahjong are explicitly non-cooperative, it is technically possible to “help” another player in Mahjong. In fact, this is what Rachel does when she gives up the one tile that would have won her the game: the eight of bamboo, and therefore handed the win to Eleanor. As astute audiences, we ought to pick up on the fact that Rachel’s strategy was not a simplistic white flag to Eleanor. The game of “chicken” previously referenced in the film should highlight that to us: Rachel is a character who just does not give up. Why does she then, in this case, act so uncharacteristically? Because her sacrificing the tile (symbolic of her future with Nick) was by itself a strategy, a strategy of love. Rachel, being rational, hard-headed, and calculative as she is, genuinely loves Nick enough to do not what would make her happy, but what would make Nick happy. She said herself that she knew that tearing Nick apart from his family would never make him really happy. In effect, Rachel realizes that Eleanor and herself were stuck in a classic “prisoner’s dilemma” situation, where pursuing their individual best interests actually leads to a sub-optimal outcome. In this case, it means hurting the object of their love and attention, Nick. There are multiple ways to obtain the optimal outcome in a prisoner’s dilemma situation, including strategies like pre-commitment or collusion. However, because Rachel acts as the first-mover, she puts herself in a vulnerable position, because there is nothing stopping Eleanor from pursuing her best interests. In other words, she acts “irrationally”, she acts out of love. But the love ends up changing the payoffs of the entire system, thus altering the rules of the game altogether. In playing this strategy, Rachel signals three things to Eleanor and to the audience. 1) Rachel is no longer playing a non-cooperative game. By drawing the tile and sacrificing it to Eleanor, Rachel demonstrates that the winner-take-all mentality – the prize being Nick – is irrational and nonsensical in the game of life. If they both truly cared for and valued Nick as a person, not as a prize, they could play cooperatively for his desires and his happiness. By sacrificing the tile, Rachel emancipates herself from the Cinderella archetype, and invites Eleanor to do the same with her evil step-mom archetype. Eleanor now has to prove that she isn’t a simple villain, and that she truly loves her son. 2) The way Rachel loves Nick is distinct from the rest of the other gold-digging relationships we see throughout the film. When put to the test, Rachel is willing to sacrifice her own personal happiness for his sake. 3) The dichotomy between individualism and communalism is a false one. 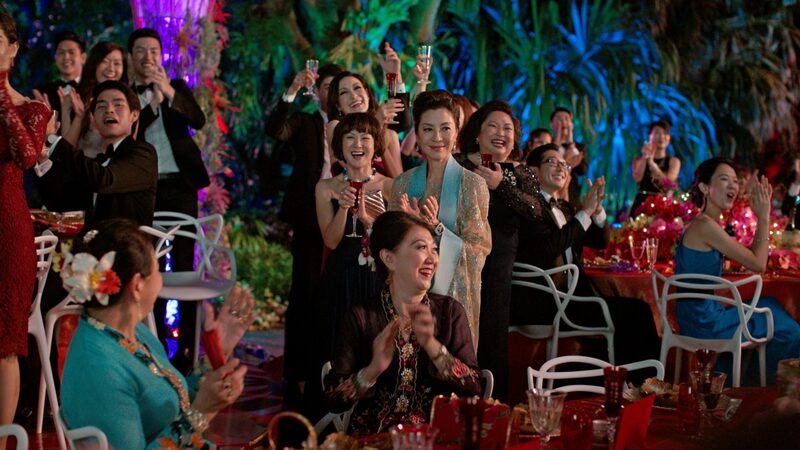 Perhaps the only thing really crazy in Crazy Rich Asians is that it points out how much of our lives are dominated by a winner-take-all, zero-sum strategy. Rachel doesn’t become more traditionally Asian, she doesn’t capitulate to elevating the family above all else, but her passions do lead her to the kind of sacrificial love that Eleanor has learnt to respect. Through this convergence of values, the true underlying tension of the film is resolved in a genuinely satisfying way. Rachel and Eleanor are not merely characters. Fundamentally they represent facets of Asian identity. Their reconciliation points to the capacity within the Asian identity for synthesis, growth and maturity. More accurately, it points to this as a human capacity, not just as one belonging to a particular ethnic group. Perhaps the only thing really crazy in Crazy Rich Asians is that it points out how much of our lives are dominated by a winner-take-all, zero-sum strategy. This is certainly the case if we have become conditioned to view everything through the lens of a power dynamic – including, for example, an increasingly popular movie featuring an under-represented minority group. The nature of power is inherently exclusive. However, the nature of love is inherently multiplicative. If we are serious about overcoming divisions, then perhaps Crazy Rich Asians tells us simply to stop playing the game, and begin really acting in the interests of the people we care about. I still enjoyed the film as a well produced, well written romantic comedy whose vision and symbolism was purposefully Asian. I have been away from Singapore, where I grew up, for more than a year now, and viewing the film in an Asian-American context evokes complex emotions. On the one hand, I long to be back with the incredible food, the efficient city and my family. As a film, I find that it is largely celebratory of Singapore and its economic successes (the controversy really lies in how it does that specifically). That said, it is important to note that the film’s cultural focus is really on a very specific group within the larger Chinese ethnic community – a particularly anglicized group that boasts wealth acquired from a colonial past. On the other hand, as a Chinese Singaporean who grew up with an anglicized name, the film, perhaps unwittingly, has also forced me to think more deeply about my cultural roots and how Anglicization has affected and shaped the person I am today. In that sense, I resonate more deeply with the Asian-American experience, which is a very different form of hybridity, but hybridity nonetheless. Ultimately, I resonated with the film on a deeper level than my cultural identity. I resonated with CRA on the level of my deepest spiritual identity, because the idea that love could overcome non-trivial divisions is central to the Christian Gospel. This idea is so radical that it seems crazy to many. I’m not saying that anybody involved in CRA necessarily had this in mind when they were making the film. However, I do think that when you try to tell a good story, the best ones have usually already been told. What follows is my reflections on CRA’s parallels with my own faith. In Christianity, the original spiritual/moral division that existed in the world was the animosity that exists between God and human beings as a result of our sin. Sin is the quality of being fundamentally opposed to goodness, and since we desire what is sinful, i.e. contrary to goodness, and God is the source of all goodness, humanity has been fundamentally divided – in fact, willfully set against God. Analogically, we are in a perpetual Poker game with God. We gamble with our time and with our lives, betting our joy and happiness on what we think we need, instead of what God says we need (he says we need Him above all things). Therefore, as long as we continue to play a zero-sum game with God, a game that we created, trying to get away with something that isn’t really good for us, there seems like there are only two options: God can let us have what we want, which is ultimately bad for us, or he can win the game by sheer force (because he’s God), and damn us for our disobedience, which is still ultimately bad for us. Just like Nick in Rachel and Eleanor’s game, we are ourselves the prize in our attempted cosmic winner-take-all game. Just like Nick, both options are bad for us – whether we “win” and get what we want, but not what we need or we “lose” and get what we deserve. What we need is a third option. What we need is an option to break the winner-take-all game itself, but we cannot do that because we don’t possess “the winning hand”. In other words, we have neither the power nor the right to dig ourselves out of the mess we have made, only God does. God’s “winning hand” was Jesus – Jesus who had the power and authority to judge the living and the dead. However, he so loved the world – us – that he sacrificed his winning hand, just like Rachel sacrificed her eight bamboo tile in CRA, not so that he could “win” the game of “my will versus your will” we were trying to play with God, but so that we could stop playing it altogether. Rachel sacrificed her tile because she loved Nick. God sacrificed his son because he loved us – this radical act of selfless abandon, this ultimate display of love, had the power to rend asunder the original, most powerful, most pernicious division in the history of all mankind, the great divide between us and the living God. Crazy Rich Asians riffs on this biblical story to bring to bear some incredibly hopeful and resonating narratives about love, divisions and identity on some of the most pressing issues of our day. Its sharp use of game theory cuts to the heart of the great post-modern problem: how divided and polarised we are. And the great post-modern problem is actually a rehash of an ancient dilemma between humanity and God himself. Behold the Lamb of God, who takes away the sin of the World! Jesus was sacrificed for us, cast out for us, but “the winning hand” doesn’t become ours until we choose to take it up and make it part of our own strategy. In other words, once we realize God’s love for us, and his invitation into a cooperative relationship, it is up to us to play according to the cooperative strategy. Like Rachel, he has made the first move, and made himself vulnerable to us. We, like Eleanor, must prove we are not simple villains. We must pick up the tile, and “win the game” according to the new rules set out for us. The longer we play, the longer we realize that the objective of this game is not “my will versus your will”, but “your will be done, your will be my will”. The Gospel is a revolution in all of religious thinking because it shatters any and all of our strategies, because we find that when we pick up the tile, our real prize is God himself, and he was playing for keeps from the start. Photos courtesy of Sanja Bucko, Warner Bros Entertainment and Kimmel Distribution.